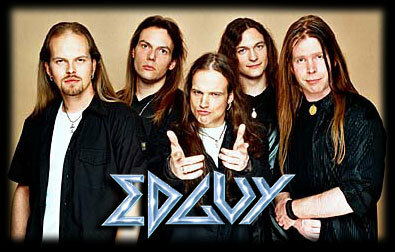 Edguy was founded in 1992 by 14-year-old students Tobias Sammet, Jens Ludwig, Dirk Sauer, and Dominik Storch. The name "Edguy" was an affectionate epithet for Mr. Edgar Zimmerer, their math teacher at the time. After two demos the band received a contract with AFM Records in 1995. Their first two albums were not very successful, but with Vain Glory Opera in 1998 they achieved a breakthrough, thanks in part to production (and additional lead guitar work) by Timo Tolkki of Stratovarius, as well as guest vocals by Hansi Kürsch of Blind Guardian. After another two albums they received a contract with the German label Nuclear Blast in 2004.